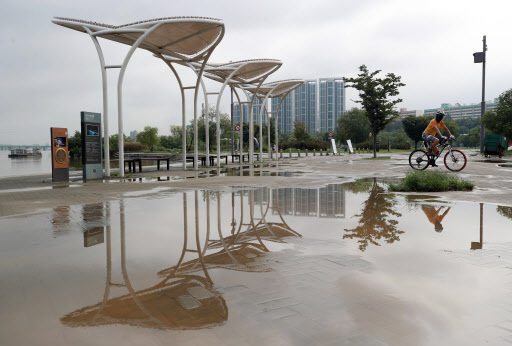 Torrential rain that lashed Korea on Wednesday night will continue to fall Thursday, but the downpour will cease in the afternoon, beginning with Seoul and Gyeonggi Province, the Korean Meteorological Administration said. Seoul, the northern part of Gyeonggi Province and Gangwon Province will receive 100 to 200 millimeters of rain, while the southern part of Gyeonggi Province and Gangwon Province will get 50 to 100 mm of rain. About 30 to 80 mm of rain will fall in Chungcheong, North Gyeongsang and Jeolla provinces. The rain will stop in Seoul, Gyeonggi and Gyeongsang provinces in the afternoon, but rainstorms are expected at night in Chungcheong and Jeolla provinces. The rainy weather is expected to continue nationwide Friday, according to the weather agency. The southern part of the country and Jeju Island will see hot weather before rain hits the areas. The daytime high in Seoul will reach 29 degrees Celsius, Incheon 27 C, Suwon 29 C, Chuncheon 30 C, Gangneng 31 C, Daejeon 30 C, Gwangju 30 C, Daegu 31 C and Busan 29 C.